Looking after our environment is the most important thing that we do on the meadow. So we provide facilities that are sustainable and leave as little impact as possible. 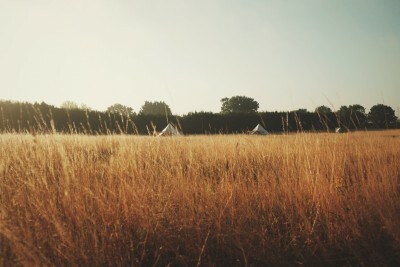 Camping is all about living lightly on the land for a few days – leaving as little trace as possible and enjoying the environment that surrounds us. You can read our Green Policy here. We have access to mains water on site, but once we have used it we need to find a way to dispose of it without causing harm to the environment. 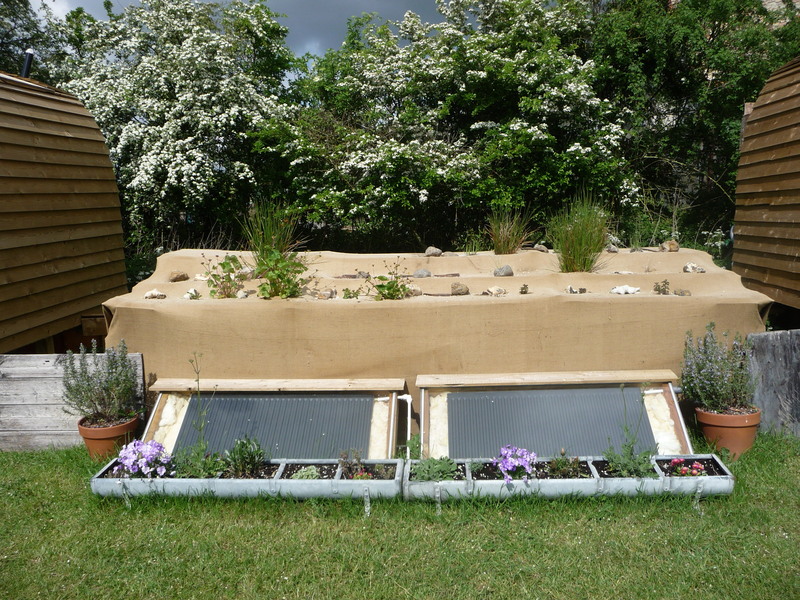 Living in one of the driest places in Britain, we also try to save as much water as we can. The grey water produced on site is recycled by ‘Grow’, a system that uses gravel and marginal plants to filter waste water. 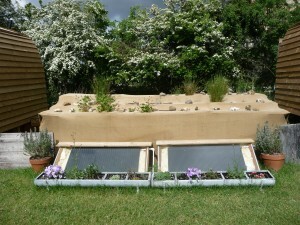 Once filtered the water can safely soak away to the surrounding hedges or can be used to water plants in the farm garden. We have an undercover washing up area with mains water supply. We provide eco washing up liquid, cloths and tea towels. When the rocket stove is busy heating shower water you can also use it as a hot plate to boil a kettle for washing up water. 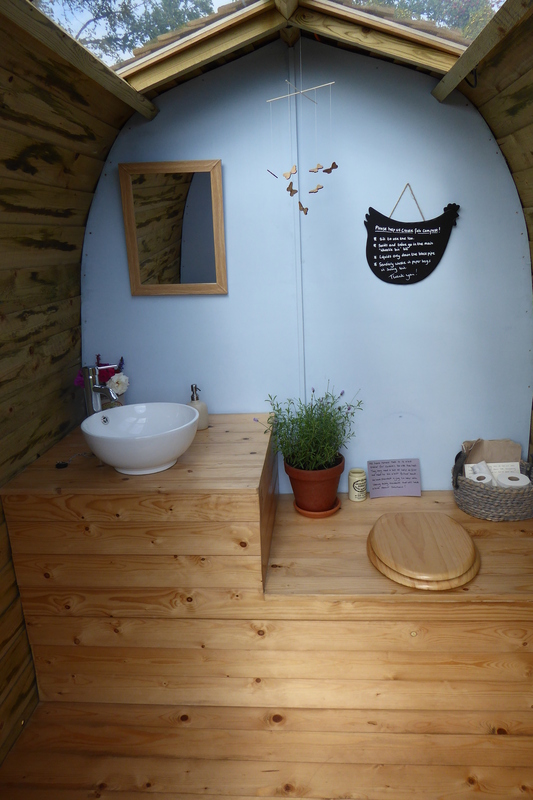 We want to do our best to help fuel the idea that composting toilets can be both practical and beautiful. We have used a design that separates liquids and solids and by providing good ventilation we can ensure that they stay smell free. 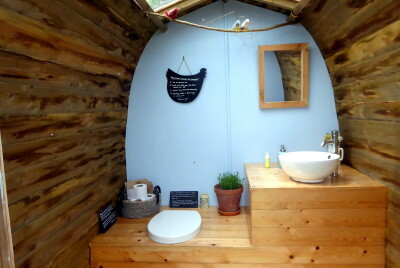 Each of the two loo huts has its own sink unit with hot and cold water, a mirror and environmentally friendly handwash. Over the years we have camped in tents that are too small to stand up in so we have also made sure that there is plenty of room to get changed or gather all of the children for the ceremonial brushing of teeth. We also have ‘The Wee Hut’ urinal for the boys. It also has its own sink unit with cold water tap. 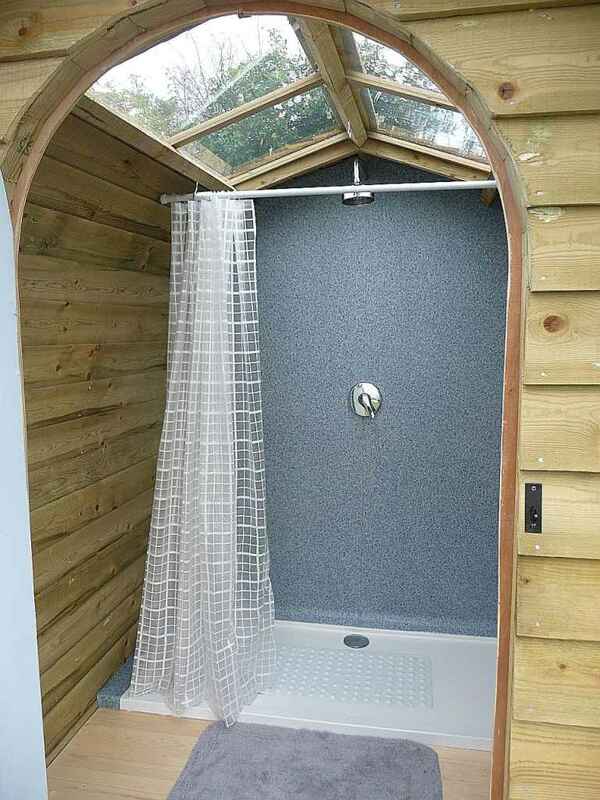 The large shower has space to get changed and hang up your clothes and towels. 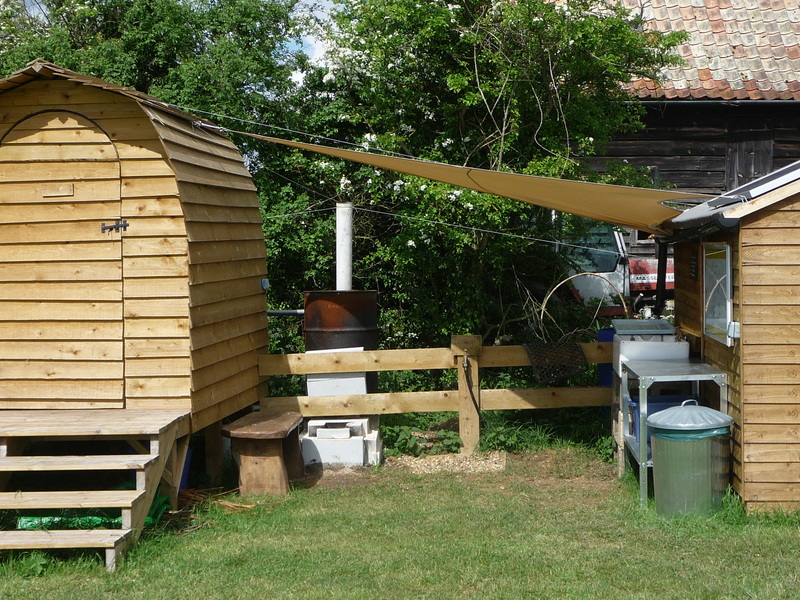 The water for the shower is heated using a combination of solar panels and our rocket stove. We have discovered, after a lot of experimentation, that water is one of the most difficult substances to heat and as it can take several hours to heat a full tank we light the stove just once a day. The water heats up in the afternoon, ready for showers in the evening or the next morning. When we are busy we don’t have enough hot water for everyone to have a hot shower every day so we ask that campers are considerate of others when using the facilities. There is no electricity on the meadow. All of the power needed to supply lights and water pumps is generated by the sun. We do have 12v USB phone charging points in the camp kitchen (phone signal here is mixed), but no 240v plug sockets. We provide battery lanterns and solar chandeliers or wall lights in the StarDome, bell tents, and the shepherds hut and living van. The fire pits are lit with lanterns and tealights. It does get very dark on site at night so you might find it useful to bring a torch with you. We try to reuse ‘found things’ as much as possible on site. We have separate bins for general rubbish, recycling and compost. On average our campers generate two bags of recycling for every one bag of general waste which is fantastic! 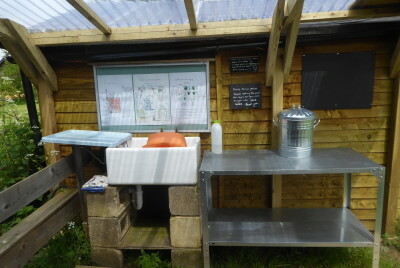 Food waste goes to a compost bin where we create compost for potting campsite plants and adding to the farm garden. We have a secure bike shed on our campsite site (takes up to six bikes) and can lend you a bicycle free of charge for an outing during your stay. We just have the one small child’s bike at the moment but we do also have a child seat to fit on the back of an adult bike. We make sure that the tires are pumped up and they are ready to go, but all of the bikes are second hand and have seen many adventures before, so we ask that you check them to make sure that you are happy before you set off. Storage space and cycle supplies are limited so please let us know if you would like to use these facilities when you book! The bike shed also contains a pump, puncture kit and bike locks. Cycle and walking maps are available to browse or borrow. We offer a 10% eco travel discount for guests arriving by public transport or under their own steam. See eco travel for further details. You can subscribe to our mailing list here. We will very occasionally send emails with our latest news and offers. Where we are . . . Copyright © 2019 Ling's Meadow. Powered by WordPress. Theme: Spacious by ThemeGrill, customised for Ling's Meadow by Just a Small Thing. Designed and Maintained by Just a Small Thing.